Adam Minoprio has skippered in the Congressional Cup and other major match racing competitions, but has a new role in the game these days: tactician for 2010 Crimson Blazer winner Francesco Bruni, in Italy's Luna Rossa campaign for the America's Cup. The New Zealand native speaks little Italian, but that isn't a problem. "Everybody on the boat speaks English," Minoprio said, "but the big thing this week is to make sure my English is clear and not too Kiwi!" It's a joke, but it must be working. Bruni's boat was among half the fleet of 10 that completed the last four flights of the first of two round-robins Thursday by winning three of four matches. Ian Williams of the UK is still alone on top at 7-2, with Italy's Bruni, France's Mathieu Richard and Taylor Canfield of the U.S. Virgin Islands hard on his tail - literally - at 6-3, followed by Sweden's Johnie Berntsson making a comeback at 4-5. All were 3-1 on the day. Competition continues with the second round-robin Friday and Saturday, followed by the semi-finals Sunday. Williams' lead would be a bit larger if Canfield, ranked No. 1 in the world, hadn't done to him precisely what Bruni did 24 hours earlier: stalking his stern and, using his right-of-way position, to force him behind the committee boat right up to the starting horn, requiring Williams (No. 2) to do a downwind turnaround as Canfield sailed away into the end of the lazy, hazy day. "Today we were starting a little better," said Canfield, who was 3-2 the previous day. "Communication on the team is better. We knew he was [approaching in the line] early, so we wanted to get him as far up in the box as possible." But the most interesting start was in the first flight of the day when Bruni and Swinton stalled dead in the water at the pin end of the line and Berntsson, scheduled for the next start, entered the box and poked his boat between them, drawing a foul. Meanwhile, Bruni was cruising at 3-0 on the day and led fellow Italian Simone Ferrarese off the starting line and around the first of two laps until, he said, "We had an issue with a spinnaker takedown. The [spinnaker] pole wasn't coming off, and the sheet caught somewhere on the hatch." Before they could straighten it out, Ferrarese was gone out of reach. Richard launched his comeback by dealing Canfield his only defeat of the day, then lost to Australia's Keith Swinton (5-4) before beating Ferrarese (3-6) and New Zealand's Phil Robertson (3-6). And Bruni seems happy with his new tactician. 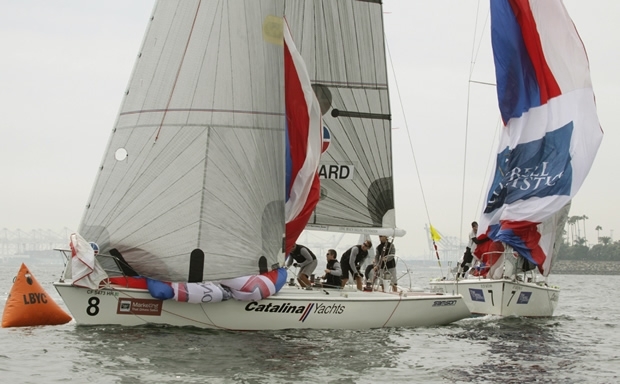 Minoprio said, "It's good that while the Kiwis have such a big role in the sailing world that I have an opportunity." He searched out a role elsewhere when it became clear that the continuing Emirates Team New Zealand campaign - unlike the dearth of Americans on the American boat Oracle in last year's successful America's Cup defense - was overcrowded with homegrown sailors. Luna Rossa's AC team responded favorably. Minoprio, 28, grew up in Auckland, "but I haven't really lived there in six years," he said, while sailing with various international campaigns around the world, including ETNZ's 2011/12 Volvo Ocean Race aboard Camper. Nine more flights remain on the Long Beach outer harbor over the next two days to determine the four semifinalists who will mix it up Sunday. 10: Scott Dickson, U.S., 2-7.